Cody Eyer (62) recovers a Troy Christian fumble during the first half of Tri-Village’s home scrimmage on Friday night. Tri-Village’s Derek Eyer (20) breaks through the Troy Christian defense dragging a couple of defenders with him for a large gain on Friday night. 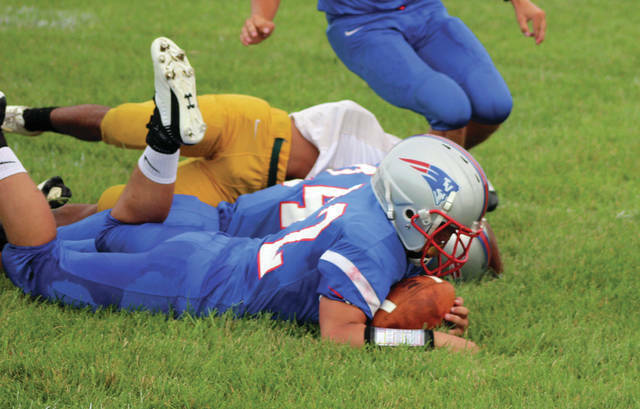 Tri-Village’s Mason Lay (64) gets the first first of a pair of sacks he had on the night against Troy Christian. Tylor Cheeseman (19) finds lots of running room for the Tri-Village offense on Friday night in the Patriots final scrimmage of the preseason. 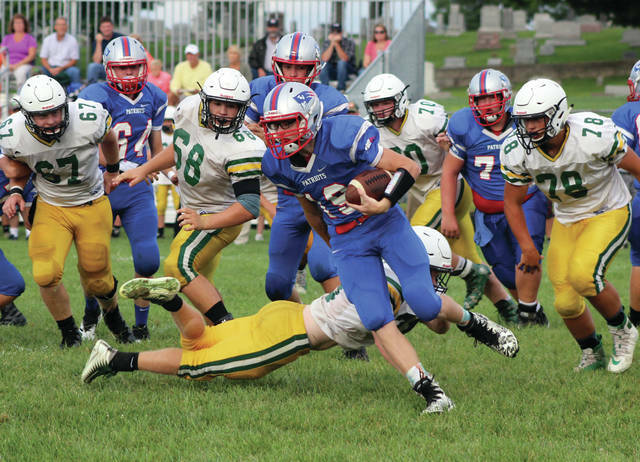 NEW MADISON – The score may not show it, but coach Robert Burk believes his Tri-Village football team is in better place than they were at this time last season. 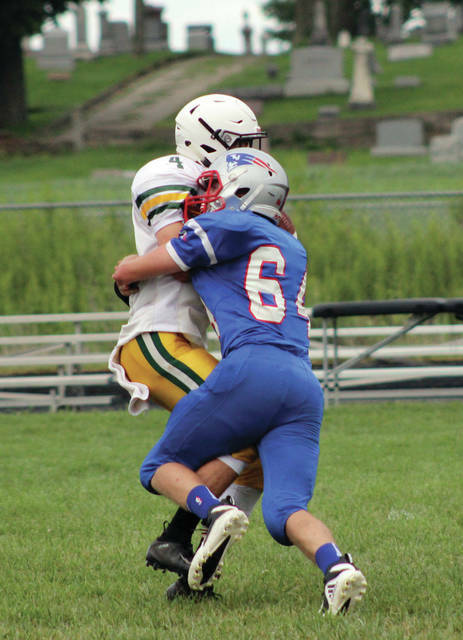 The Patriots hosted Troy Christian for the final scrimmage game of the preseason on Friday night, and though the varsity squad lost 28-0 to the visitors, Burk was pleased with many aspects of his young team. As far as the defense goes, Burk said there were plenty of positives there as well including a few defensive highlights such as a fumble recovery by Cody Eyer and a pair of quarterback sacks by Mason Lay. Troy Christian scored on its opening possession for a 7-0 lead. “We don’t start games very well for whatever reason,” Burk said. “They had first possession and drove right through us. We’re trying to get better at it, but after that first series we kind of shut the run off and made them try to pass the ball a little bit and they had success hitting like three or four big vertical routes on us. 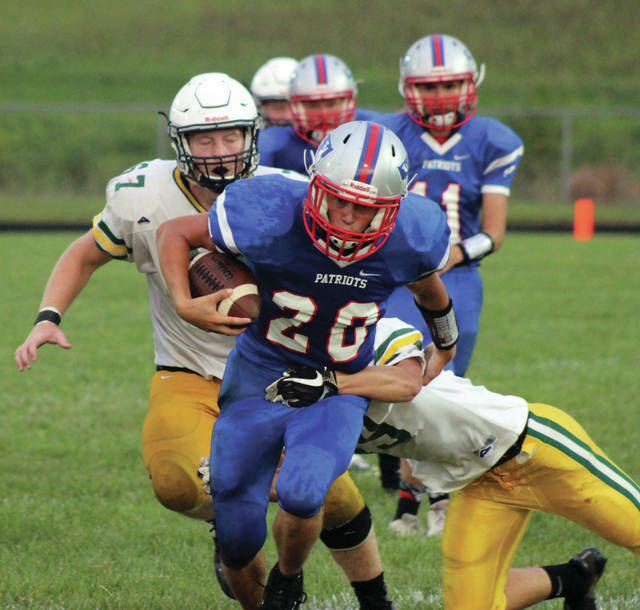 Tri-Village then got its offense moving with several gashing runs by Tylor Cheeseman, who rumbled 15 yards on the offense’s first play from scrimmage and then went 13 more a couple plays later. Cheeseman finished the three-quarter varsity contest with 34 yards rushing. The last quarter of the scrimmage was played by the reserves. “We flashed a little bit on offense,” Burk said. “We had some really good spots but we had trouble putting some things together. With a freshman quarterback that happens some times. We fumbled the ball twice and we can’t let that happen. This entry was tagged CCC, Cody Eyer, Derek Eyer, High school football, Mason Lay, Robert Burk, Tri-Village Patriots, Troy Christian, Tylor Cheeseman. Bookmark the permalink.